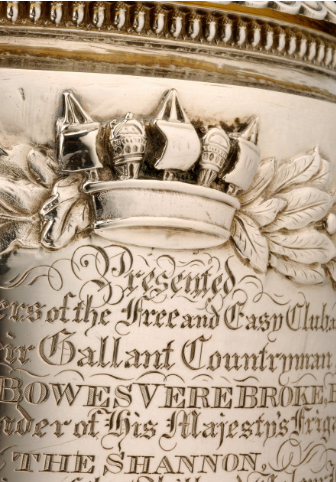 Captain Philip Bowes Vere Broke was born just outside Ipswich in Suffolk and lived at Broke Hall, Nacton. During the war against America that started in 1812, he commanded the Shannon. Broke introduced training for his crew, especially novel gunnery techniques, that led to a decisive victory. 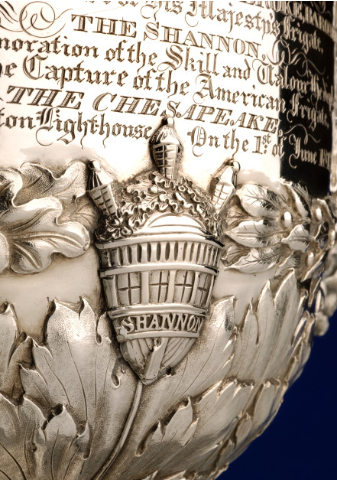 Facing the US Chesapeake, a heavily armoured frigate with a larger crew, the Shannon captured it in barely 15 minutes. This victory caused a sensation within both of the conflicting countries. 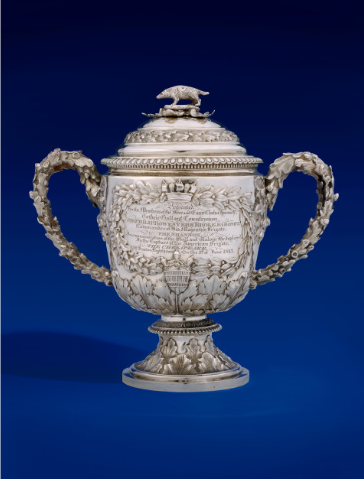 Broke was feted and presented with many honours, one of which, this handsome silver cup, was presented to him by the Free and Easy Club of Ipswich. Broke was promoted to Rear Admiral. However, due to a severe head wound received during the battle, he retired to his home at Broke Hall and never went to sea again.